WASHINGTON - House Democratic leaders said yesterday that they were working to gather votes to override a veto on a popular children's health program, but pledged to find a way to cover millions without insurance should their effort fail. At the same time, the White House sought to chide the Democratic-controlled Congress as the obstructionists in reauthorizing the State Children's Health Insurance Program, also known as SCHIP. It said Democrats were the ones who had shown unwillingness to compromise. Deputy press secretary Tony Fratto quoted President Bush as saying he is "willing to work with members of both parties from both houses" on the issue. In talk show interviews, Speaker Nancy Pelosi and Steny Hoyer, majority leader, did not dispute claims by Republican leaders that the GOP will have enough votes to sustain Bush's veto when the House holds its override vote on Thursday. Pelosi and Hoyer promised to pass another bipartisan bill if needed. "Isn't that sad for America's children?" said Pelosi, Democrat of California, when asked about the GOP's assurances the override vote will fail. "It doesn't mean we aren't working hard throughout the country: governors, mayors, people who deal with children on a regular basis. "We'll try very hard to override it. But one thing's for sure: We won't rest until those 10 million children have healthcare," she said on ABC's "This Week." 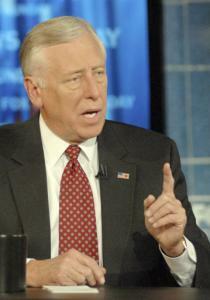 Hoyer, Democrat of Maryland, declined to predict Thursday's vote. "This is a defining moment for the Republican Party, in my opinion," Hoyer said on "Fox News Sunday." Hoyer later added that the program is "not going to die. We're going to go back and we're going to pass another bill." House Democrats scheduled the vote after Bush earlier this month vetoed legislation that would increase spending for the SCHIP by $35 billion over five years. Bush has called for a $5 billion increase. An override requires a two-thirds majority in the House and Senate. The Senate approved the increase by a veto-proof margin, but the earlier House vote fell about two dozen votes short. The program provides health insurance to children in families with incomes too great for Medicaid eligibility but not enough to afford private insurance. Bush has said the bill is too costly. The president now says he might be willing to provide more than $5 billion originally offered but that the current proposal shifts too much insurance burden onto the government rather than private providers. Yesterday, House minority leader John Boehner, Republican of Ohio, said he hopes that Democrats will agree to negotiate once the veto is sustained so that the children's insurance program can be reauthorized. "We will have the votes to sustain the president's veto," Boehner said. "And I think the differences are resolvable, but we're standing on our principle that poor kids ought to come first." "Most people don't want government-run health insurance," he added. "Republicans are working on a plan that will provide access to all Americans to high-quality health insurance, make sure that we increase the quality of health insurance that we have in America."